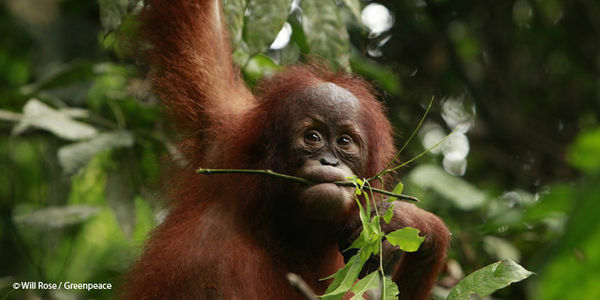 petition: You can save orangutans from extinction. End dirty palm oil now! You can save orangutans from extinction. End dirty palm oil now! In the last 16 years, demand for palm oil has destroyed nearly 60 million acres of rainforest, causing the population of orangutans to plunge from 250,000 to less than 100,000. Palm oil is everywhere. It's in our soap, detergents, makeup, and biofuel, to name a few. Major global brands like Unilever, Mondelez, and Nestlé like palm oil because it's cheaper to grow than many of its alternatives, takes up less land space, and has a long shelf life. However, the production of palm oil has serious consequences for forests and the endangered animals, like elephants, tigers and orangutans, who rely on them. Palm oil is almost exclusively grown on large plantations, meaning landowners have to clear large patches of forest to make space. If we don't act, more precious habitats will be ruined, Indigenous Peoples could lose their homes, and the remaining orangutans can be lost forever. Add your name and tell big companies to stop using palm oil from rainforest destroyers.